Since 1983, we have created 18 hectares of wildflower meadow and have restored six derelict ponds. 5.5km of conservation headlands and 2 kilometres of hedgerow have been planted or restored including 300m which were 'laid' as part of a regional hedge laying competition in the winters of 1998 and 2000. This work has produced a network of wildlife corridors throughout the farm and a haven for beneficial insects around the production areas. We installed three artificial otter holts along our section of the river Lesser Teise in conjunction with The Kent Wildlife Trust otter project group in spring 2000, and otters have subsequently been sighted on this stretch of river. The business has worked closely with the RSPB as a partner in the Farmland Bird Survey (the Volunteer and Farmer Alliance) since 2005. All expected species are visiting, resident or breeding in significant numbers and all red list species have been recorded on the farm since 2007. As a result, a significant project involving winter bird food strips, allied to the installation of colonies of nest boxes, continues to run in an attempt to boost Tree Sparrow numbers. During the winter of 2007/08, seed strips comprising such high feed value plants as sunflower, millet, sorghum, quinoa and fodder radish (a favourite of Tree Sparrows) were planted and flocks of finches and migratory Bramblings well in excess of 200 individuals were in continuous occupation until late February 2008. As a result, an MSc project was hosted during winter 2008/09 to establish the optimum hedge height and density favoured by these feeding birds to enable future winter food plantings to be of maximum benefit. Whilst the raw data indicated a preference for boundaries comprising higher hedges and trees, over the course of the project this was statistically inconclusive. Winter feed plantings continue as do observations; the indications are that over the course of the year, there are over 70 bird species present on the farm. 2009 saw the start of a regular ringing project on the farm. Birds are trapped, their weight and body condition assessed, and are then fitted with a tiny unique ring for future identification. This provides information about the birds using the farm and contributes to the work of scientists at the British Trust for Ornithology who conduct research into how bird populations change. The farm is an active member of Operation Bumblebee, and plantings of nectar rich plants have taken place across the farm to help revive the fortunes of this iconic species. Not only are the alleys in the concept orchard and many of our conservation headlands planted with red clover, but a further 2.5 hectares of our open land have been planted with a mixture of this spectacular plant and white clover - a favourite of the honey bee. This has proved an invaluable food source for all sorts of insects and has had the added bonus of creating the ideal conditions for small mammals, the increased numbers of which have led to a significant increase in the populations of predatory birds such as kestrels and sparrow hawks. Barn Owls, Little Owls and Tawny Owls are all to be found on the farm and a pair of common buzzards nested in woodland adjacent to the farm during the summer of 2008; these birds are now a common site wheeling over the farm in groups of up to five at a time. HE Hall & Son were 1998 finalists in The Broadoak Silver Lapwing Award for conservation, a national competition organised by The Farming and Wildlife Advisory Group (FWAG). In 1999, Peter Hall was overall winner of The Worshipful Company of Fruiterers Environmental Awards, and winner of The Emsden cup presented by the Country Landowners Association for outstanding contribution to wildlife conservation in the county. He also won the Wildlife Conservation section of Kent County Council's Environment Awards for Kent Business in the same year. In 2000, Peter was winner of The Marks & Spencer Organic Grower of the Year, and runner up in the Top Fruit Grower of the Year. 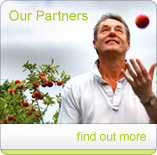 In 2008, HE Hall & Son were finalists in the Asda sponsored Business Initiative of the Year award for 'The Organic Concept Orchard', and Highly Commended in the 'Organic Grower of the Year' award. Working for wildlife for more than a century.